The Intervals team has been busy cranking out our latest round of updates. 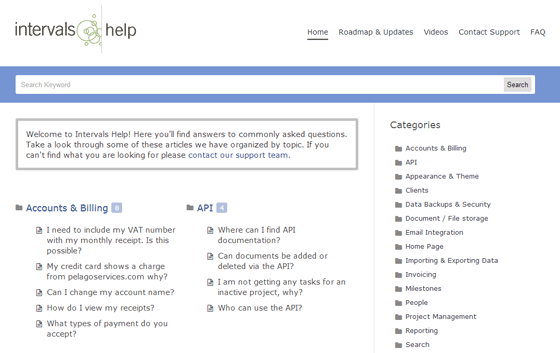 We’ve made improvements to our web-based project management software and added more help documentation and videos. Plus a few other things. Intervals has always allowed you to start a general timer not associated with a task. This functionality is quite useful when starting a timer for a task that doesn’t yet exist, or you don’t want to bother searching for the task before starting the timer. When you apply a timer, or add time in general, Intervals gives you the option to select a task. But what happens when you have too many tasks to choose from? Locating the one task in a list of tens, sometimes hundreds, of tasks can be frustrating. Now the task listing includes a keyword search at the top of the task list. 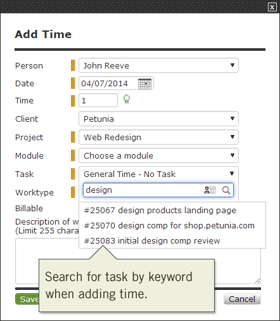 Type in the task number, or a keyword, and Intervals will whittle down the task list to only the matching results. Applying a general timer and adding time to a specific task just became much easier. 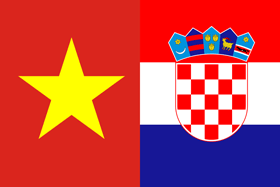 Thanks to some help from our customers in Vietnam and Croatia, we now have locale support for these two countries. The new locales can be found by going to Settings & Defaults under the Options tab. With each Intervals update we continue to tweak things under the hood. And this update is no exception. With this update we focused our efforts on speeding up database performance and updating the document storage servers. We know performance is important to our customers. Which is why we are committed to improving the software’s speed and reliability with each update. Our customers have been asking for more document storage ever since we introduced the feature. We’ve been listening, and the new Unlimited plan is our response. With this plan you get unlimited everything. Unlimited projects and unlimited document storage. This new plan is ideal for agencies that don’t want to worry about outgrowing their software. We scoured our support email archives, our forums, and our blog —seven years worth of helpful content — and distilled the contents into our new help site, located at help.myintervals.com. If you are looking for answers to common questions about Intervals, our new help documentation site will have them. If it doesn’t, submit your question to us and we’ll post the answer. The help site is still a work in progress. We’ll be adding more documentation to the site as it becomes available. We’ve recorded a few new videos to help you get started with Intervals. Our videos cover everything from setting up your account to generating robust reports to analyze your data. Our newly recorded videos cover topics such as project management overview, settings & defaults, and default modules & work types. We are in our sixth year of partnering with 1% for the Planet. This year, we were able to make generous donations to The Land Trust of Santa Barbara County and Bici Centro. None of this would have been possible without our customers. So we say “thank you,” for your continued support of Intervals, and by extension, the environment.